While the Singapore of today is a modern metropolis of the tropics, the island nation was still a largely undeveloped city state at the time of its independence in 1965. Facing an uncertain economic future, its leadership had to grapple with major issues such as a poor economy, severe unemployment and social unrest. Seeking the consultation of Dutch economist, Dr Albert Winsemius, Singapore’s leadership embarked on a rapid programme of industrialisation to drive economic growth and create jobs. Foreign investors were courted to set up business in the country, while the nation developed its workforce through education and training. This marked the beginning of Singapore’s rise to become a modern economy and its transformation from a Third to First World country too. In many ways, the evolution of Singapore’s built environment has mirrored that of its economic success and social development. Here, let us look at how the country’s architectural milestones have run parallel to its socioeconomic development. Right from the start, Singapore’s architectural imprint was an eclectic mix of styles, reflecting its Malay, Chinese and Indian cultures, as well as western influences. This could be seen in the conservation buildings from the era, including major places of religious worship, British Colonial government structures, as well as community enclaves. Even while Singapore was rapidly modernising as a city, the government and urban planners took care to balance that against the preservation of important heritage buildings. This was carried out through the Preservation of Monuments Board, with an initial batch of eight buildings – including major places of religious worship such as the Cathedral of the Good Shepherd, Armenian Church, St Andrew’s Cathedral, Hajjah Fatimah Mosque, Thian Hock Keng and Sri Mariamman Temple – granted legal protection as national monuments. The conservation efforts continued through the years, with clear principles drawn up for building owners, architects, engineers and contractors to apply in their conservation efforts. The key purpose was to ensure that the original structure and architectural elements of historic buildings are retained and restored as far as possible, without reconstructing the entire building. To date, over 7,000 buildings across more than 100 areas have been conferred conservation status. One of the major issues facing Singapore as a young nation was the housing crisis. At the time, only 9 per cent of the population were living in public housing, with many inhabiting squatter colonies and city slums with poor hygiene conditions. In 1960, the Housing and Development Board (HDB) was formed with the mission of developing low-cost housing for the people. The initial HDB flats were simple and utilitarian in design and build. These were mostly 1-, 2- and 3-room flats with the most basic of amenities such as electricity and piped water. They were also high-rise and high-density to better cater for the long-term needs of the population. For a population used to urban slums and rural habitats, these spartan flats offered a better quality of life. Much thought went into the planning of these new public housing estates. In the late 1960s and 1970s, the HDB adopted the New Town approach of integrating residential areas with a town centre, parks, commercial and industrial areas, as well as communal and residential facilities. Toa Payoh was the pioneer new town, while Ang Mo Kio and Bedok followed after. From the precinct concept to more intimately scaled estates and right up to premium apartment blocks, HDB’s approach towards public housing has continually evolved through the years to cater to the diverse needs and aspirations of the Singapore people. One of the highlights of HDB’s public housing development in recent years has to be the iconic Pinnacle@Duxton in the central district of Tanjong Pagar. The design for Pinnacle@Duxton was the work of two Singapore-based architecture firms, who emerged winners in an international competition. Completed in 2009, the development comprised of 1,848 premium flats spread across seven 50-storey buildings, which are in turn interconnected by sky bridges on the 26th and 50th levels. Flats from the development which have been resold on the market, have often broken price records – a testament to their desirability. 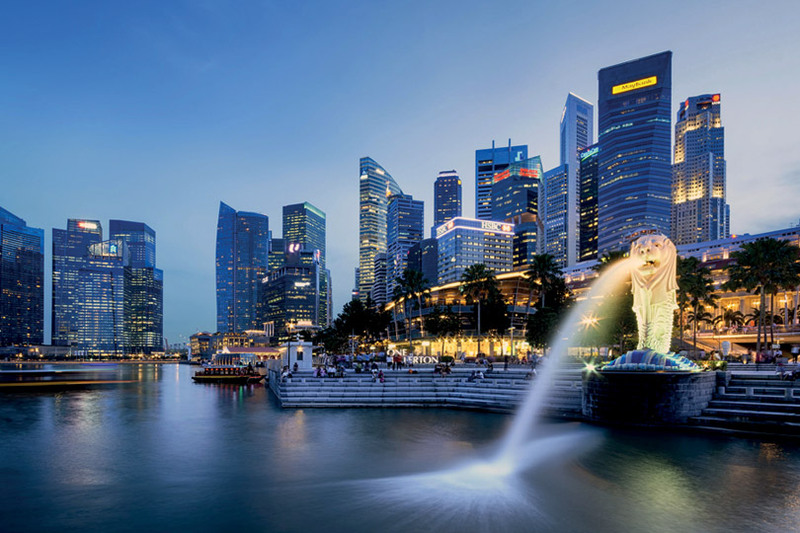 Singapore’s economic success in recent decades has seen the Republic elevated to become one of the major business and financial hubs internationally. Its architectural landscape has also seen a subtle transformation with more iconic designs dotting the landscape. One area which has seen significant change in recent years is the waterfront business district of Marina Bay. In 1983, the Urban Redevelopment Authority (URA) laid out its grand vision for the Marina Bay district in its conceptual master plan. The redevelopment groundwork took place through the years, setting the stage for new and exciting landmarks to populate the area. Taking pride of place in the downtown financial district is the sprawling Marina Bay Financial Centre (MBFC). Designed by New York based architects Kohn Pederson Fox, the MBFC is the new epicentre of Singapore’s financial district, with three distinctive office towers, two residential towers and a retail complex, all clustered around a waterfront park. For visitors to Singapore, there is the iconic Marina Bay Sands integrated resort. Its structural form is distinctive even from far, comprising of three connected hotel towers crowned by a giant SkyPark. There is also the prominent ArtScience Museum with its facade resembling that of an open lotus flower. Further afar, one can also spy the outline of the Singapore Flyer, Asia’s largest giant observation wheel. Living up to its moniker of the Garden City, Singapore also boasts the magnificent Gardens by the Bay. Built on 101 hectares of reclaimed land, this cooled conservatory – designed by Wilkinson Eyre, Grant Associates, Atelier One and Atelier Ten – is a breathtaking marriage of nature, architecture and engineering. It sports a Flower Dome, Cloud Forest and the iconic Supertrees - tree-shaped vertical gardens between nine to 16 storeys tall. In 2012, Gardens by the Bay won the World Building of the Year Award at the World Architecture Festival. Singapore has witnessed in recent years several new luxury condominiums with highly distinctive designs by internationally renowned architects. One such development is the Reflections at Keppel Bay, designed by master architect Daniel Libeskind. Completed in 2011, the development features six curved glass towers and 11 fan-shaped villa blocks affording panoramic views of Mount Faber and Sentosa. Another condominium development which has captured the architectural imagination in recent years is The Interlace at Depot Road, which clinched the World Building of the Year at the 2015 World Architectural Festival. Completed in 2013, the residential property was designed by OMA/Ole Scheeren and features 31 blocks of apartments stacked in a hexagonal arrangement, winning the praises of the judges for its bold, contemporary architecture and thinking.